With intensive R&D, the Net-2-Print classifieds booking system Ads2Book.com was created and imbued with AI (artificial intelligence) that assisted users through the entire process of Creating, Booking & Paying for their Print Classified Ads, all from the comfort of their desktop. Having created the robust booking engine – TimesClassifieds.com, and experiencing the tremendous response to it, especially to tap new unexplored markets overseas, the Times Group decided to provide its capabilities to Print Media Houses across the nation and globally, and re-launched The World’s Only Publication Neutral Ad Booking engine – Ads2Book.com in August 2006. The Global Ads2Book.com Booking Engine is distinctive in the fact, that unlike other publications around the world, which offer an online enquiry solicitation form, which an individual fills up, following which someone from the Publication contacts them with the details, rates, and procedure for booking a classified Ad. Ads2Book.com is Completely Automated, the entire process of Creating, Booking & Paying for Classified Ads is offered in a secure & transparent online transaction process. Ads2Book.com even offers Cash & Cheque pick-up facilities to users who are not net-savvy and feel uncomfortable making secure payments on-line. Key Features of The Global Ads2Book.com Booking Engine include templates and options for users who are not aware of how Ad Copy is written – assisting them in creating their Ad. The Ads are created as per formats acceptable to the Individual Publications and editions that the individual wishes to advertise in. This not only simplifies the process for the individual, but also allows publications to extend their deadlines for receiving Ads, as the Ads that come to them through Ads2Book.com are formatted in a way that can go straight into their system, without alterations. Ads2Book.com also calculates the exact cost for their Ad, based on the latest rates that are updated by the Individual Publications themselves, with their latest schemes and group discounts offered across their editions and split runs. Ads2Book.com serves over 40 categories of classified ads both online & in print, and is an all-inclusive, ‘horizontal’ portal, straddling all the major categories of Recruitments, Properties, Matrimonials, Vehicles & Business Opportunities. 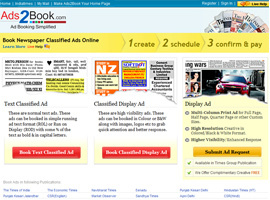 The Global Ads2Book.com Booking Engine provides Classifieds Advertising spaces, not only in Times Group publications but also across 35 partner publications with over 100 editions, at present.